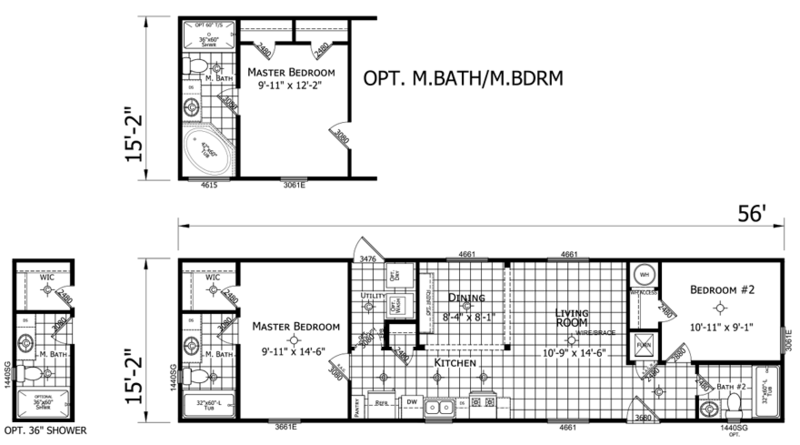 The Chimayo model has 2 Beds and 2 Baths. This 840 square foot Single Wide home is available for delivery in Texas, Louisiana, Arkansas, Oklahoma, Mississippi, New Mexico. If you are looking for a compact but comfortable place to call home, the ‘split floor’ Chimayo mobile home might be the ideal choice for you. The inviting living room sits adjacent to a quaint dining area and galley style kitchen in an arrangement ideal for entertaining, and the large walk-in master bedroom closet is fit for a king. Prefer “his & hers” closets over one large walk-in closet? You can have that, just ask a housing consultant. Ask your housing consultant about the other great features that come standard on the Chimayo manufactured home.